Can you believe it’s December already?! Where did the time go? 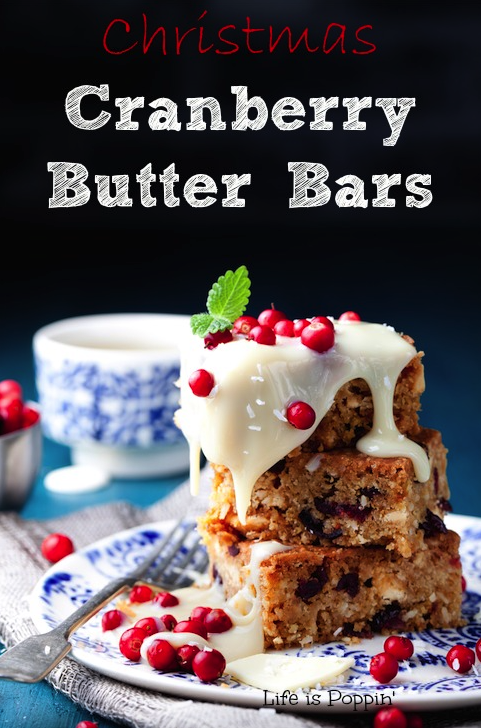 To celebrate the holiday season I love to make these super delicious cranberry butter bars. It sort of shakes things up a bit from the traditional “Christmas cookies”. They are so easy to make and so easy to eat. Let me know what you think! Place sugar, butter, cream, and salt in a large saucepan and bring to a boil, while stirring constantly. Allow to boil for about 5 minutes, then remove from heat. Carefully add the powdered sugar and stir well. Then mix in the vanilla extract. Fold in the cranberries until evenly distributed. Spray an 8 x 8-inch baking dish lightly with cooking spray and spoon in the mixture. Place in the refrigerated and chill until firm. Cut into 1-inch squares and enjoy!